Cut Metro Hours? 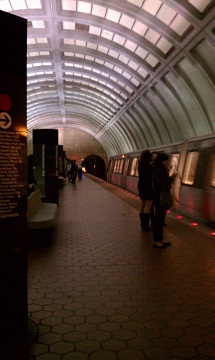 Lose $50 Million from D.C.
Save $3 to 5 million by cutting service? Lose $7 million in revenue. Or $50 million in matching funds from D.C.
A Metro source tells WTOP city officials are less inclined to kick in their share of dedicated funding if they know they are going to lose millions in revenue from the rollback of late night weekend hours. If D.C. were to hold back its share of dedicated funding, it could set off a troubling chain reaction. The move would essentially break an agreement with the federal government, which sends $150 million in funds per year to Metro. That money is to be matched year after year by D.C., Maryland and Virginia — all putting in $50 million each. Preliminary figures show that stopping service at midnight instead of 3 a.m. could save about $3 to $5 million per year. Metro staff has also said cutting back on the hours would essentially give Metro maintenance personnel an “8th day” of work to complete repairs on the system. However, Wells is now calling for a full analysis of how much revenue D.C. would lose if late night rail service is scaled back. Privately, some say that figure could be as high as $7 million per year. Who is Tagging the Red Line?